The Aboriginal Pavilion, based in the heart of downtown Vancouver (West Georgia Street & Hamilton St), promotes the culture and heritage of Canada’s oldest people, as part of British Columbia’s showcase during the Vancouver Winter Olympics. A light and visual effects show, traditional food and artwork have attracted 14,000 spectators each day since the start of the Games. The 2010 Winter Olympics are being held within the traditional shared territories of the Lil’wat, Musqueam, Squamish and Tsleil-Waututh. Organisers of the Pavilion hope that the high media exposure the Olympics brought to the host city will give greater publicity to the diverse first nations of Canada. “The Pavilion is our showcase to the world,” said Tewanee Joseph, CEO of the Four Host First Nations Society. 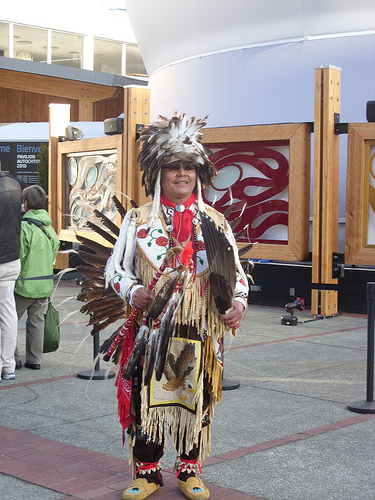 Denise Conner, a visitor of the pavilion who has travelled from Seattle to come see the cultural aspects and ambience of an Olympic City said: “I’m interested in how the Aboriginal people are represented. I’m not here for the sport but for the experience and atmosphere of the Games”. Erin Linton and Geoff O’Donnell are Master’s students at the University of the West of Scotland and are contributing to Culture @ the Olympics during their stay in Vancouver.